100% of incoming freshmen receive a guaranteed minimum $5,000 annual award. The question isn’t only about your future. It’s also about the present, because God has already given you special gifts and passions. And those gifts and passions are as unique as His purpose for your life. At Oklahoma Baptist University, we want to help you find your place, both on our campus and in your life, calling, and career. We will prepare you to think critically about worldviews, values, and truth to discover God’s plan for your life and your place in the world. 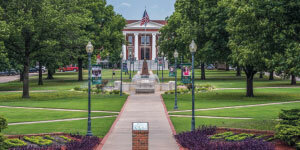 OBU has a reputation for strong academic programs, with a liberalarts curriculum connecting different fields of study for a well-rounded education. OBU faculty members are more than professors. They are visionaries helping you imagine who and what you might become. With a student-faculty ratio of 15:1, OBU offers a climate where students can ask questions and find answers. Such a personal approach has produced outstanding results, and that success has led to national recognition. For 27 consecutive years, U.S. News & World Report has ranked OBU as one of the top 10 comprehensive colleges in the western United States. The Princeton Review named OBU a “Best in the West” college for 2019, and Forbes.com has repeatedly listed OBU as one of Oklahoma’s highest-ranked universities. The United States Navy recently identified OBU’s Physics and Mathematics majors as the only Tier 1 academic majors in the state of Oklahoma and the North Texas region for the Navy’s Nuclear Propulsion Officer Candidate Program (NuPOC). OBU academics integrate faith into all fields. You’ll experience a Christian world-view in business classes just as you will in religion classes. Faculty and students actively discuss their faith on a college campus that is truly Christ centered. 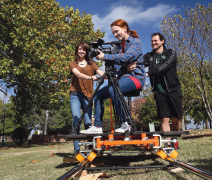 Also, OBU is committed to providing students with an interdisciplinary approach to education. As a result, all OBU degree programs feature a common core of classes designed to provide a solid foundation of knowledge. It is another part of a commitment to providing you a well-rounded education. As you find your place at OBU, you will find abundant opportunities to serve others, whether on campus, around the community, or on the other side of the world. 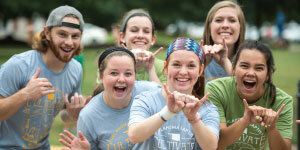 OBU Campus Ministry provides students many ways to worship and serve. You’ll also find community at OBU through service projects and worship experiences. You will be encouraged by a network of mentors among our faculty, staff, and upperclassmen. In fact, finding community at OBU won’t be the hard part—deciding where to plug in first will. This focus on service has led OBU to be a national leader among Baptist colleges and universities in the number of graduates working in international service or missions vocations. A distinctively Christian liberal arts university, OBU expects students, faculty, staff, and alumni to honor God with their lives. This expectation exists wherever the student may be, whether in the classroom, the dorm room, across the campus, in the community, or around the world. On our campus, known as Bison Hill, you will not be alone as you find your place. Most OBU students live on campus, and connecting your God-given talents with classroom training occurs best in the context of family and friends. Our students participate in a wide range of activities throughout the year, including a strong intramural sports program, club sports, student talent shows, concerts, and Bible studies. OBU also competes nationally in 21 NCAA Division II varsity sports. You are unique, and God is calling you to a unique future. Even before you were born, God designed a plan to shape you into the person He intends. Find your place at OBU and find the purpose God has for your life.